Greetings from the South. We had an uneventful trip down to Ushuaia and got on the boat Saturday afternoon. Though we’re still jet lagging (these turkeys wake us up at the crack of 7 for breakfast — yikes!) we’ve certainly had plenty of time to catch up on sleep. We’re in Port Stanley, the Falklands — arrived yesterday morning and spent the day visiting two islands off the western island and this morning arrived in Stanley (the largest city). This is actually our third visit to Stanley so we opted out of the tour and instead spent the afternoon walking around town. We had a Guinness at the Liberty Bar (thought we’d branch out — we usually go to the Globe) and decided not to have the fish and chips since they’re really not that good (the fish is most likely frozen fish fingers shipped in from Chile). It was 65 degrees, sunny and not even windy (not typical Falklands weather). We brought cold weather clothing but I doubt we’ll be wearing it unless the weather radically changes in South Georgia — which it easily could. It was raining the first night in Santiago, which was lovely since they’re at the end of a long summer and really needed the moisture. That part of Chile feels very much like Southern California — mountains, vineyards, dry and smoggy. Ushuaia was overcast but warm enough that we didn’t need a sweater. After South Georgia we’ll be in heading toward the equator so we’ll certainly be packing away all the fleece. Barn has played piano every evening — it’s not going to be a very demanding job. I think he’ll organize some singalongs (there are a couple John Prine fans and singers aboard). The crew is delightful although we were very disappointed the “expedition leader” that we had last year had to leave suddenly because his dad is dying. The guy that replaced him is very nice and knowledgeable, but he doesn’t have the same enthusiasm and people skills. The ship isn’t full so we’re 1:1 passenger to crew. There are several people from National Geographic: the recently retired head of photography, a writer that’s been with them for 30+ years, his wife who also wrote for the magazine, a historian, and a couple more photographers and then all the naturalists. I’ll have to really try hard to not get a decent photo or two with this illustrious group (I may even learn to write a decent travelogue). Our fellow passengers are an interesting bunch: the usual potpourri of retired doctors, lawyers and university professors (Barn and I are in the bottom rung of years of education in this lot), all liberal (thank goodness — couldn’t really stomach too many republicans at the moment) and all very well-traveled. It’s a different group than last year, more “peak-bagger” types that want to go to these out-of-way places more to check them off a list than having had a lifelong desire to see, for instance, Shackleton’s South Georgia. There are several birders — who are always unique. Another difference is there are a couple of young people along (young being in their 20s). The hiking contingent seems somewhat smaller too. We did two walks yesterday that literally wiped out most of the group (Barn and I didn’t break a sweat — what does that tell you???). 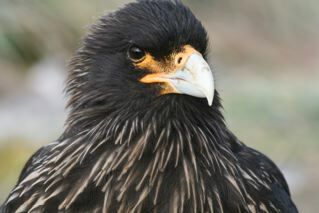 This is a striated kara kara, one of perhaps 1,000 breeding pairs in the world, 99% live here in the Falklands. They’re huge, curious, mischievous and I think very beautiful. The locals call them “Johnny Rook” and think of them as pests (what do they know!!). 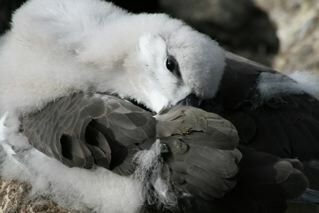 This is a three-month old black browed albatross fledging. After shedding the downy feathers in about three more weeks, he will take to the skies for perhaps 3 to 4 years before coming back to this colony to breed. They are completely waterproof and will rest on the ocean even if they don’t come back to land. 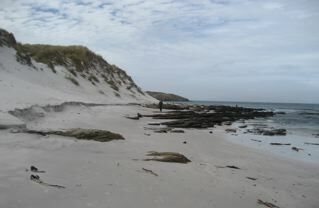 A beach in the Falklands. Who knew they have gorgeous white sand beaches. We’re pulling out of the harbor now on our way to South Georgia. We hope for calm seas. This entry was posted on Thursday, August 26th, 2010 at 7:12 am	and posted in Uncategorized. You can follow any responses to this entry through the RSS 2.0 feed.